Pokemon Go: Which Team Should You Join? 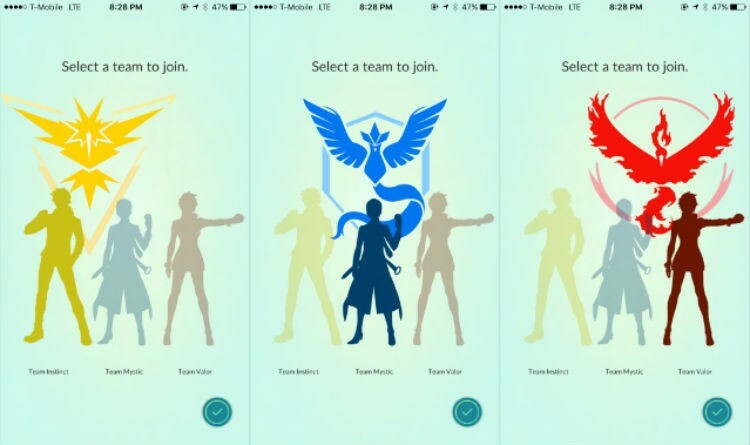 The obvious choice is Team Valor, but just in case you're not sure, here's a guide to deciding which team you should join in the world of Pokemon Go! Pokemon Go is more than just a reason to get out in the world and start walking around with your face glued to your phone. It's also a reason to fight with your friends over which team is the best. Yes, there are three different teams in Pokemon Go, and your experience may very well change forever based on which one you decide to join. They're all opened up to you after you hit level 5, so you've got a little time to make a decision as to which team is best for you. But don't leave out into the world without consulting our guide first, lest you be saddled with a team that doesn't fit you. You can't go back and change things if you decide you're willing to go with another team, so choose wisely, and remember every move you make is for the good of your team. If you're interested in being the "very best like no one ever was," you might decide to go with Team Valor. The fiery red team features Moltres as its mascot as well as the leader Candela. She's a voracious leader with an appetite for victory and is all about following your strength as a person and Pokemon trainer. If you're passionate about all you do and want to use that passion and strength to move forward, you'll want to side with Candela. Team Mystic is more like the "brainy" squad, and they want to evolve their Pokemon any chance they can get. They're calm, cool and collected, much like the icy legendary bird they use as their calling card: Articuno. They're a team of scientists and thinkers, and it's all about intelligence for them. If you're a thinker over a fighter and you're more interested in furthering Pokemon research than you are being the best, Team Mystic is for you. This team is all about going with your instincts and trusting your gut feeling in various situations. Leader Spark is all about keeping people and his Pokemon team in line, but it's all about ensuring you're living for what you believe in. Zapdos is the legendary bird associated with the team, so if you're feeling electric about life, you'll want to play with Team Instinct. These three teams may not technically change how you play the game as far as stats or what Pokemon are available, but they will change the reasons you play. You might want to check with your friends to see which team they've chosen and confer with them as to what you should do tgether to make sure everything works out and you get the gyms you need to succeed. Or if you're already beyond this part, there's plenty of other stuff to do.